keep warm as you surf the web in your basement like we do! The first full-length release from our favorite jam crew! Hail a cab in this fashionable 2 Ft. Taxi long sleeve from Mind Mined! A package of 8 classy black postcards bearing the name of your favorite online arts community. The Rhythm Ship EP from 2005 featuring "Don't", "Disco Cyst" and more! An all original album of unabashedly Beatles-inspired songs. You'll be more than happy with this CD from Ecstatic! Ride in style with us on your stern! Your baby, our bib. Mindmined.com... don't get any on ya! 2 Ft. Taxi Limited Edition Thong! front reads "Hailing a cab in this baby will be *really* easy, gals!" Who said we aren't cuddly here at Mind Mined? pledge your allegiance to nothing in particular, except us! wake up with a Mind Mined logo on your cup! The debut 2 Ft. 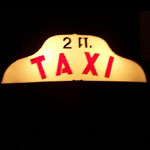 Taxi CD that has since become a classic! All original tunes for the holiday season! A bargain preview from the cabbies who play it all! Oh-so-collectable Mindmined.com sweatshirt; look schnazzy with us.